Catch category for beige henleys! In Everybody Loves A Clown (2x02), Dean wears it to the Roadhouse and for the drive to the circus. In The Usual Suspects (2x07), Dean wears it when he and Sam are at the coffee shop. In Playthings (2x11), Dean is wearing it upon arrival at the Pierpont Inn. He leaves it on until after putting drunken Sam to bed. In Fresh Blood (3x07), Dean wears it at the very end of the episode when he teaches Sam a bit about fixing the Impala. In Heaven and Hell (4x10), Dean wears it at the end of the episode when he tells Sam about what happened to him in Hell. In Death Takes a Holiday (4x15), Dean is wearing it when he is nursing his concussion after being thrown around by Alistair in the graveyard. He wears it until the end of the episode. In Fallen Idols (5x05), Dean wears it from the beginning of the episode until after Sam is attacked by Ghandi, whenever he is not wearing a suit, that is. In Sam, Interrupted (5x11), Dean wears it to the interview at the psychiatric hospital. He is then forced to wear scrubs once he is admitted. 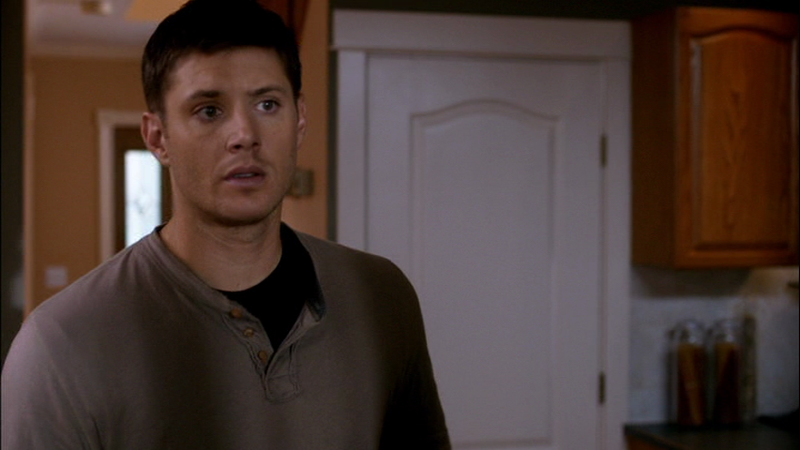 In The Song Remains The Same (5x13), Dean is wearing a beige Henley in his dream. 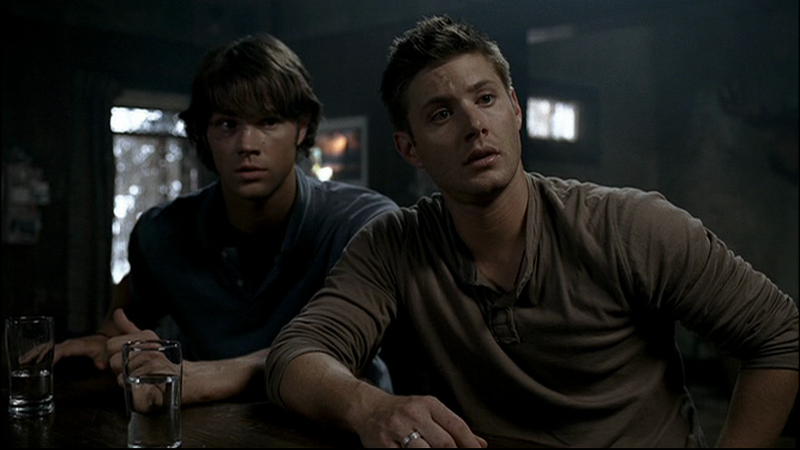 In My Bloody Valentine (5x14), Dean wears it when they are at Bobby’s house and Sam is detoxing. In Two Minutes to Midnight (5x21), Dean wears it at the very end of the episode, when he and Bobby discuss Sam’s plan to say yes to Lucifer. In Two and a Half Men (6x02), Dean wears this at the end of the episode when he and Lisa talk. He is still wearing it when he uncovers the Impala. In Season 7, Time for a Wedding (7x08), Dean wears a beige Henley at the end of the episode when Sam signs the annulment and they bid farewell to Garth. In Repo Man (7x15), Dean is wearing a beige Henley upon arriving (in the present) at the motel in Coeur D’Alene. He changes into a suit to investigate the case. In Pac-Man Fever (8x20), Dean wears a beige Henley when he and Sam realize that Charlie is missing and keeps it on until they save her. In Heaven Can’t Wait (9x06), Dean wears a beige Henley at the beginning of the episode when he, Sam, and Kevin are researching in the bunker, and Dean gets the call from Cas about a possible hunt. Dean leaves the bunker still wearing the Henley, but has changed into a suit when he arrives at the scene of the crime. FATE: In Sam, Interrupted (5x11), once Dean is admitted to the hospital, he is forced to wear scrubs. One has to wonder what became of his clothes – as when he escapes later, he is still in scrubs. I can't help but notice Dean's scar on his forehead in the first few episodes of the season... I wanna kiss it better whenever I see it. I love that this fandom supports ridiculous endeavors like finding the episode for ONE picture. :D I am looking forward to it someday. First, I need to watch S8!! this looks similar to the one he wears in 'The End'. the color is tad off (maybe it's the lighting? ), but the buttons and the little square stitching thing on the bottom looks very close. It might be the same one! Does End!Dean wear it? I didn't record End!Dean's clothes the first time I watched the show, because I considered him the same as Wish'verse!Dean and that he'd have a wardrobe completely his own that we'd never see again. Of course, that theory went out the window when I later recognized the Green Military Coat of Doom in 5x18, and had to quickly go back and add that in. So, this is all to say that you're probably completely right and I should add in the fact that End!Dean wore a beige henley.